Khula Aasmaan is the new age platform for children and young students which encourages creative thought and innovation. Find amazing artworks and stimulating content by the young generation. 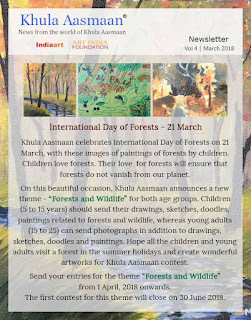 Participate in Khula Aasmaan contest and get featured on indiaart.com. Forests are our lifeline, they are our hope. Forests protect the earth and its climate. Forests are essential for our survival. Visit to historical and heritage sites is a fascinating experience. It enriches our knowledge of our past and gives us an insight into the linkages of the past with the present and lessons for the future. Khula Aasmaan urges children and young adults to explore the fascinating world of Outer Space through their creative expression. They can paint the stars, planets, galaxies, the space missions, the rockets and go beyond the current understanding. We worship our rivers. They are our lifeline. Without the rivers, we will not exist. For centuries, rivers have fascinated the creative mind. Writers, poets, artists, photographers, film makers have all been fascinated by rivers and have told their stories. Travel you must, for it keeps you alive and young. Each travel of yours will enrich you with knowledge and you will come back with several unique experiences. Khula Aasmaan does not believe in restrictions. 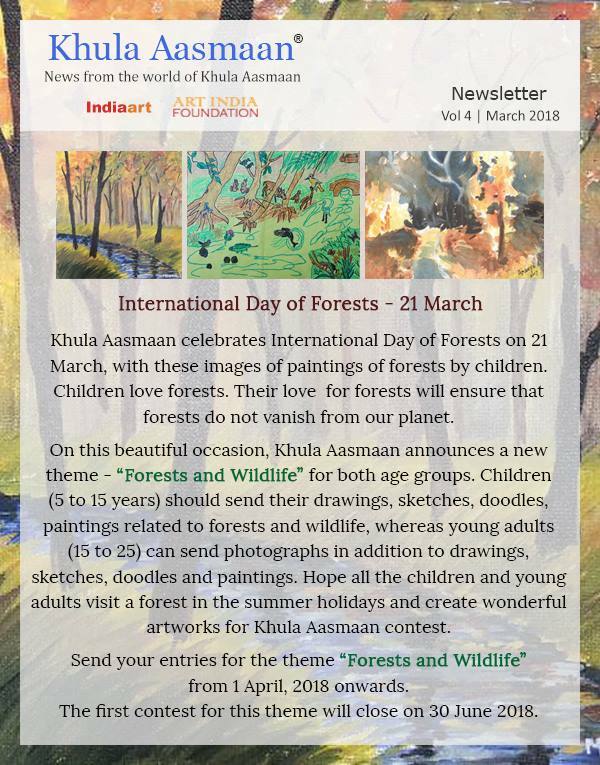 Apart from the suggested themes, Khula Aasmaan will be happy to accept entries on any other theme or subject that any child or young adult wishes to work on.